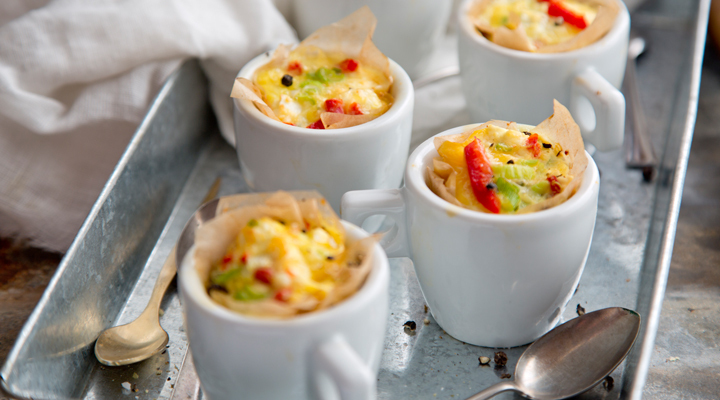 These little quiches are my go-to snack when there is ittle food left in the house. Use just about anything you like as the filling, such as ham, smoked salmon, blanched asparagus, blue cheese or cheddar. They make the perfect breakfast or ideal snack for tiny mouths, especially when on the move. They will keep for a day or two in the fridge, so they're also a great make-ahead breakfast. Preheat the oven to 180oC/gas mark 4. Line a 12-hole mini muffin tin with paper cases. Toss the cheese, peppers and spring onions together in a small bowl, then divide evenly between the paper cases. Beat the eggs in a small jug and season with salt and pepper. Pour the egg into the cases to come just to the top. Bake in the oven for 10 to 12 minutes, until puffed up, golden and just cooked through. Leave to cool a little in the tin before removing. Enjoy warm or cold. Tip: If you don't have mini muffin cases, simply grease the tin holes well with a little olive oil before filling and make sure you remove the quiches before they cool completely, or they may stick.